Brazil MissionsWe’re going to Brazil THIS summer and YOU could join us!!! Check out team information, overview videos, team guidelines, and frequently asked questions below and then apply HERE when you’re ready. This year we have 3 trips to choose from! Check it all out NOW and then jump online to apply and submit your deposit by March 18th. 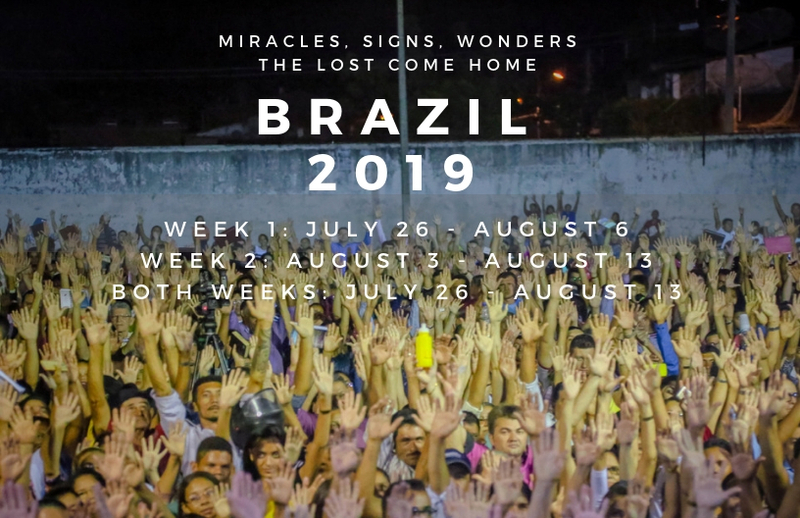 WEEK 1: July 26 – August 6 in the city of Trairi. This is the first time this city will have a crusade like this. Dean & Cassie Goossen of Awaking Hope Ministries will join us as fellow preachers and leaders for this week. WEEK 2: August 2 – 13 in the city of Guanambi. This will be a follow up trip from a House School of Ministry team where the mayor invited team leader, Dave Hauer, to bring a group back to do another week of ministry and celebrate the city’s 100th year anniversary. BOTH WEEKS: Come for both weeks and join us for back to back crusades!! Watch this video to see what our team will do during a typical week of ministry and see if you’d like to join us! So You Want to Go to Brazil? #1 Read through the Team Member Requirements below. #3 Receive Your Acceptance Email. Once you submit your application we’ll be in touch with you with any questions and to confirm if you’ve been accepted. #4 Get Your Passport & Start Fundraising. We will set you up with your own web page where you can raise support and give you great resources and strategies to help you. Apply for your passport immediately after being accepted if you don’t already have one. We do not expect you to be perfect and we will do a lot of training before the trip to help you get ready but there are certain requirements each applicant should meet before you apply. Walking with Jesus and in love with him. 18 years old or older, unless accompanied by a legal guardian. Physically healthy . . . enough to travel internationally and be on your feet and ministering for the majority of each day. While we do have some rest time each day, our schedule will be very busy. Emotionally/mentally healthy . . . This trip is a time to pour out on and serve others. If you are in a season of needing a lot of ministry or inner healing for yourself then this isn’t the right trip for you right now. Responsible financially . . . We’ll give you great fundraising tools and even links to set up your own web page with a financial tracker. We’ve never had a team member not go for lack of finances but you should know that you are responsible to make sure your trip gets paid for, if you back out finances are not refundable, and if you miss payment deadlines you will be removed from the team. Flexible and correctable . . . Sometimes our accommodations are beautiful and sometimes they are very basic. Sometimes plans change and sometimes leaders may need to help team members adjust their expectations or behavior in the best interest of our hosts. Team members need to be ready to adjust to change and trust that our leaders have everyone’s best interest at heart. Prepared to prepare and connect . . . We’ll send you an email for the team each week and you should plan to spend about 30 minutes a week doing something to get ready for the trip. We’ll have about 3 in person mandatory team meetings and also have a closed Facebook group where team members can interact. Cost Includes all flights, visas, housing, food, and transportation. Cost Does Not Include: Fees for your personal passport (which must be good for 6 months after we return and have at least 6 completely blank pages), spending money for souvenirs, snacks, or personal items/medications. See a city transformed as you watch the Kingdom of God released through your hands! 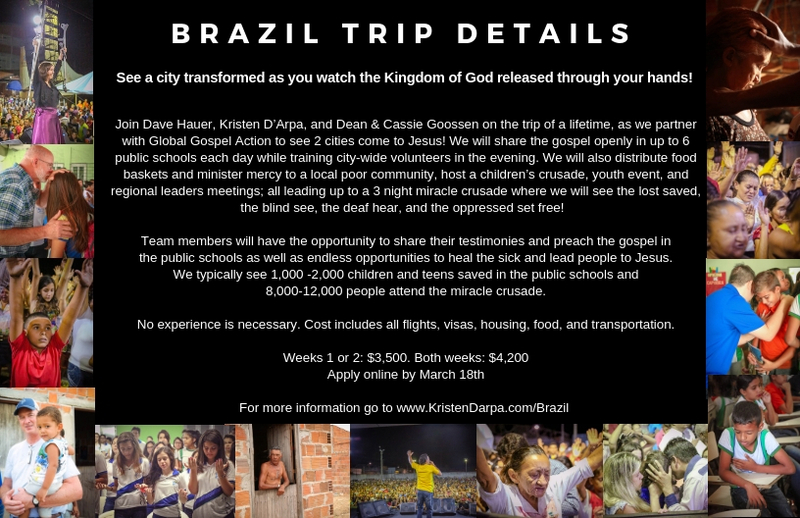 Join Kristen D’Arpa, Dean & Cassie Goossen, and Dave Hauer on the trip of a lifetime as we partner with Global Gospel Action to see a city come to Jesus! We will share the gospel openly in up to 6 public schools each day while training city-wide volunteers in the evening. We will also distribute food baskets and minister mercy to a local poor community, host a children’s crusade, youth event, and regional leaders meetings, all leading up to a three night miracle crusade where we will see the lost saved, the blind see, the deaf hear, and the oppressed set free! Team members will have the opportunity to share their testimonies and preach the gospel in the public schools as well as endless opportunities to see the sick healed and the lost saved. We typically see 1,000 -2,000 children and teens saved in the public schools and 8,000-12,000 attend the weekend miracle crusade.